If Rio de Janeiro is Brazil’s golden, glamorous face, and the Amazon its exotic, mysterious heart, then Salvador da Bahia is its irrepressibly joyful soul. Famous for its wild festivals (Salvador’s Carnaval gives Rio’s a run for its money) and friendly, fun-loving people, this colorful colonial city is alive with music and history. Ready for some sizzling beats in the tropical heat? From impromptu street parties to folkloric festivals, music pervades Salvador, while its sun-drenched beaches are legendary. 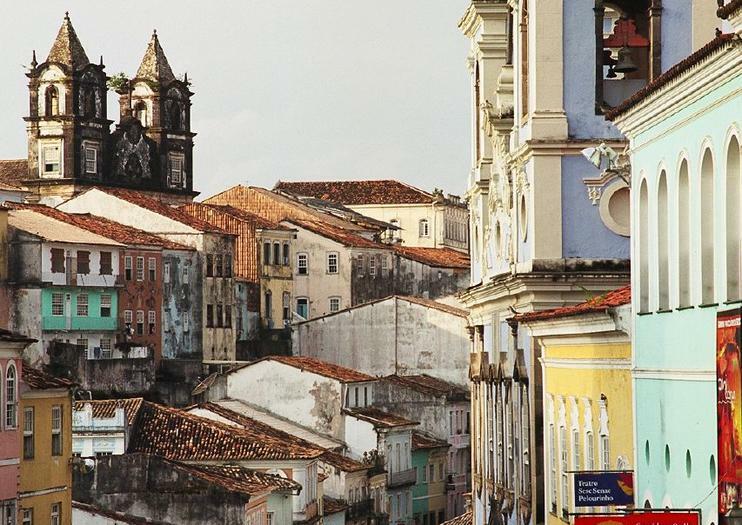 Add beautiful buildings and a fascinating Afro-Brazilian culture, and you’ll be hooked. Set on an enormous bay (Baía de Todos os Santos), Salvador is divided into High and Low Cities (Cidades Alta and Baixa respectively). Cidade Alta is home to the historic center – a riotous labyrinth of narrow cobbled streets, brightly painted Baroque buildings, art galleries, museums, music workshops, eateries and bars. Imagine times gone by as you admire landmarks like the Praça da Sé, Rio Branco Palace, Terreiro de Jesus, and 16th-century Forte de Santo Antônio. Hitch a ride in the Elevador Lacerda – an incredible Art Deco elevator that transports over 50,000 people per day – to reach Mercado Modelo in Cidade Baixa. This famous market is bursting with exquisite local crafts and souvenirs. Ready to party? Have a blast while learning about Bahía’s unique Afro-Brazilian culture at an exuberant folkloric show. Salvador boasts over 30 miles (50km) of fabulous, clean beaches. From calm inlets perfect for swimming and diving, to popular surf beaches, you’ll never be short of a sandy spot to lay your towel. Tourists generally head to Porto de Barra, Flamengo and Stella Maris; if you’d prefer to splash about with the locals, Jaguaribe, Piatã and Itapoã are your best bets. Alternatively, a relaxing schooner cruise around the bay will take you to beaches beyond your wildest desert-island dreams! Day-tripping opportunities abound around Salvador. Accessible only by boat or charter plane, Morro do São Paulo is an idyllic village on Tinharé Island. Though extremely popular with local and international tourists, it retains an irresistibly laid-back vibe. Laze on the beach, dive the translucent waters, or explore its walking trails. Just 44 miles (70km) from Salvador is Praia do Forte, a seaside paradise nicknamed the ‘Brazilian Polynesia’. Besides its divine beaches, Praia do Forte is renowned for its sea turtle conservation program, the Tamar Project. All beached-out? Soak up the history in Cachoeira, a World Heritage-listed town with beautifully preserved Baroque buildings and informative museums.